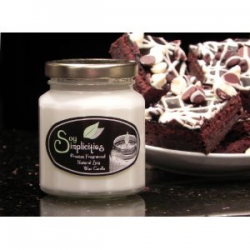 The scent of freshly baked brownies in a candle! I don't know about anyone else, but I just love coming home to a house that smells amazing. One of my favourite smells has to be chocolate brownies (or just chocolate in general). Just think of the way that freshly baked chocolate smell fills the house, then think how wonderful it would be to have that whenever you wanted, without having to actually make the brownies. I'll admit, it would be nice to have the brownies to eat, but this soy wax candle definitely comes a very close second, and is better on your waistline! It comes in a lovely round jar, that's perfect for reusing. Also, unlike normal wax, soy wax can be cleaned up by warm water and soap, allowing you to get rid of all residue wax left over in the jar. It also makes cleaning up any spills really easy, which is great for anyone worried about getting anything on furnishings accidentally. If you're using the jars afterwards for storing food products, then just remember to sterilise them first, as I'm sure you would with any other jar. This candle is one of the smaller sizes you can get on the market in a jar, at 8 oz, but if you're thinking of trying out scented soy candles for the first time, perhaps you want to start smaller. With the smell of freshly baked brownies packed into this soy wax candle, I can't see how you can go wrong. How about Lemongrass and Coriander? For me, lemon is always the smell of Spring and conjures up images of sunshine and clean things. That might just be because we used to have a lemongrass diffuser in the house during spring cleaning, I don't know. Maybe it's because lemon is such a fresh, sharp smell. 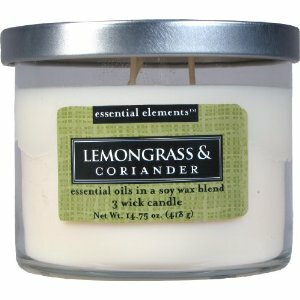 The coriander in this candle gives the sharpness of the lemongrass a spicy edge and depth, making the overall scent fresh and soothing. Like the other candles mentioned here, Candle-lite's soy wax candles are made of 100% soy. This not only means the wax is dissolvable in hot soapy water, but also means that the candles burn more evenly at a lower temperature than normal paraffin candles. You can now reuse the jars that your candles come in (and with this being a 14 3/4 oz jar that's quite a bit of storage), since they burn all the way to the bottom of the jar, and are easily washed to get rid of any residual wax left. Candle-lite Essential Elements - Big candles, small candles, diffusers - they do it all! 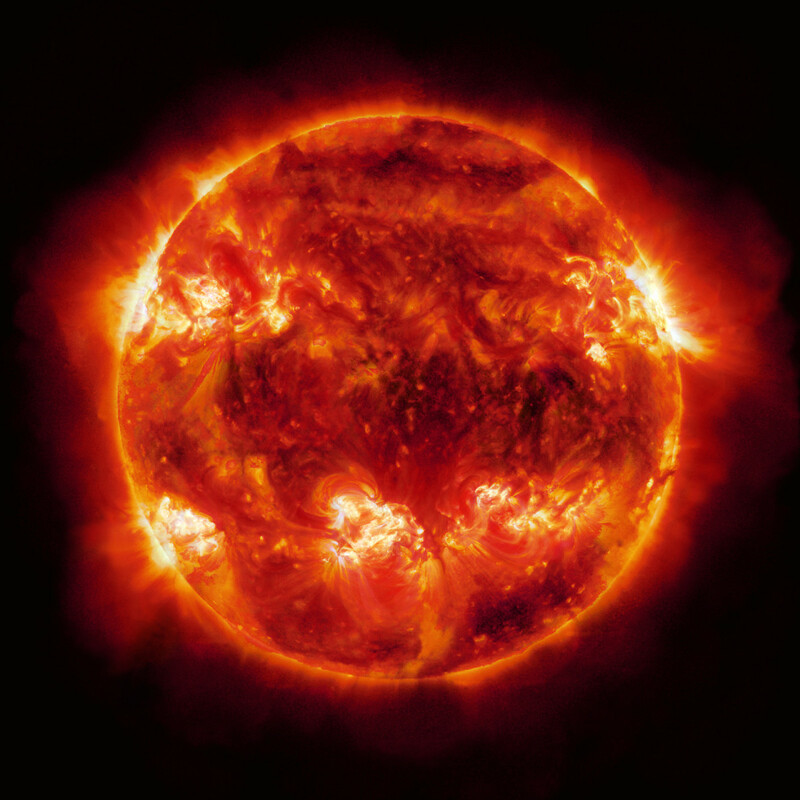 US-made, ASTM compliant candles means high quality products you can rely on. There are a lot of you out there (I'm more of a tea fan myself), and often even just the smell of coffee can perk you up a bit. Well, if you're trying to cut down on the 5 cup-a-day habit, but don't even want to think about not having coffee in your life, maybe a coffee scented soy candle can help. You just light it, sit back, close your eyes and dream of... well coffee! 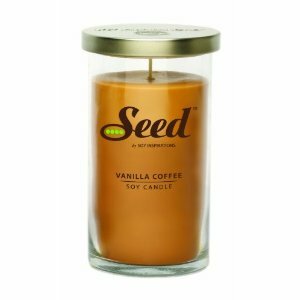 The Soy Seed candles are strongly scented - so much so you can often smell them before you open the box. Come to think of it, the Vanilla Coffee flavour's not only great for people who love coffee, but also for those who can't drink it, but love the smell. No caffeine anyone? With favourites such as Lemon Twist, Crisp Cotton, Lavender Sage and Vanilla Bean, as well as some more unusual scents like Vanilla Coffee, Crumb Cake and Cherry Blossom. Oh and not forgetting the all important unscented soy candles. Do you have a favourite scent? - Or maybe a combo of scents? Love soy candles. Always burn them at our house. Picking one scent is tough. Enjoyed your lens.